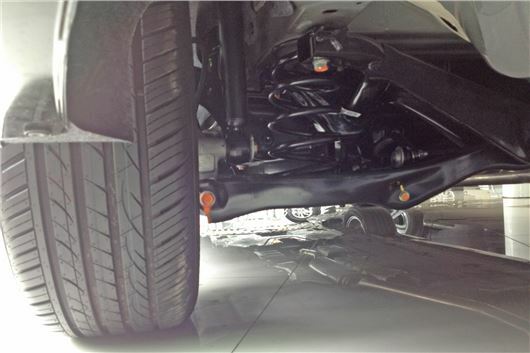 A peek under the new 2016/2017 Honda Civic, already on sale in Thailand, shows that the new World body can take independent rear suspension. The suspension looks to be bolt on, but is fully independent, so, while the car could be offered with a rear twist beam like UK Civics from 2006 to 2016 it can definitely take a coil spring independent set-up. The Thai Civic saloon measures 4,630mm x 1,799mm x 1,416mm, so is quite a big car. Luxurious features for the 869,000 baht sticker price (£17,380) include a 1.8iVTEC motor, 7-speed CVT transmission, a stop/start switch, electromechanical parking brake with auto brake hold and Advanced Touch including Apple Car Play. Important figures are an NEDC 147g/km CO2 and 45.5mpg. There is also an RT version featuring the new 1.5 litre turbo motor. A happy note for UK buyers is that, unlike the HR-V, the new Civic offers a huge spare wheel well that look like it could take even an 18-inch wheel. The Civic 1.8EL I explored was on 215/55 R16s.